The business of retail depends heavily on continually refreshing the shopping experience as well as providing a visually pleasing setting where customers feel inspired to shop. Even the most loyal customer can get tired of the “same old, same old” and be wooed away by the new kid on the block. While the post-holiday lull can be tough for retailers, it also presents the perfect opportunity to take a critical look at retail spaces and see what can be done to improve traffic flows and merchandising of key products. Chuck Lee, Vulcan Industries’ Director of Creative Strategies, discusses five fundamental merchandising strategies you may have never considered before. Take it from the top. Think about your retail space from the top down. High, white ceilings with bright lighting create an open, inviting floor space while allowing customers to read merchandise tags and product boxes with ease. Consider the type of lighting you should use. Is it appropriate for the type of merchandise you have on display? For example, in a jewelry store, LED lights on display cases let diamonds shine their brightest. Is it right for your store and customers? Does it mesh with your brand? What kind of mood or experience are you trying to impart? As you’re surveying your space, also consider lines of sight. How far back do you want customers to see? If it’s all the way to the back of the store, make sure that way-finding signs are still clearly visible and unobstructed by modular displays. Give people room to move. Sufficient space is paramount to the shopping experience. Too much is obviously costly for the retailer, but too little will make customers uncomfortable, creating a claustrophobic atmosphere that’s not conducive to extended shopping. When optimizing your retail space, take into account not just the square footage available but also how it will be used on a day-to-day basis. Think about all store traffic—customers with shopping carts, associates with pallet jacks, and so on—and how wide aisles should be to accommodate this. And don’t skimp; too-tight aisles can create bottlenecks and traffic jams, deterring customers and defeating the whole purpose of being open for business in the first place. How much space is enough? Some space needs are universal, such as the ADA requirement that aisles be at least 42 inches wide so that a wheelchair can maneuver comfortably, but others will depend on what type of business you’re running. If you’re a big-box store using forklifts, aisles will need to be 12 feet wide, whereas if you’re a grocery store, two shopping carts wide is the rule of thumb. Aisle length is also important. 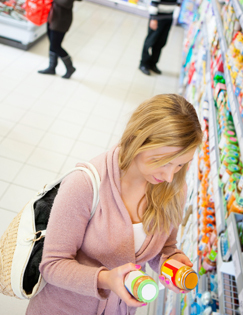 Extremely long aisles can make customers feel trapped and reluctant to enter. Mid-aisle cut-throughs are an excellent solution, particularly where space is limited or support structures dictate their presence anyway. Anything you can do to create more space, or the illusion of it, will encourage shoppers to stay longer—and buy more. Make sure shoppers are doing more than “just looking.” Well-designed, effectively placed retail displays should encourage customers to interact with the merchandise. The more they pick it up, look at it, and study its features, the more likely they are to buy. Choose store fixtures that let shoppers experience the product as much as possible. In some cases, product displays may include messaging, to both educate the consumer and build brand loyalty. The more complex or expensive the product, the more interaction and/or messaging is needed for customers to feel confident in their purchase. Being able to play video games, test stereo equipment, or see how many HDMI ports a TV has before buying will greatly enhance sales. Cross-merchandising, or placing related items nearby, such as mice for computers, can help you upsell and significantly boost average order value. Checkout space, the final frontier, offers yet another upselling opportunity. Whether you have individual lanes, a bank configuration, or separate checkouts in each department, be sure to present companion products, accessories, warranties, and impulse items to customers on their approach to the register. Remember that looks matter. Store display fixtures that are broken or incorrectly installed make for a lackluster and sometimes awkward shopping experience. If they’re old-looking, dinted, or scratched, replace them. Think you can’t afford to? Gondola shelving offers a cost-effective solution, with base decks designed for replacement. Pegboards start looking ratty after a few years as the holes get worn, so don’t keep them beyond their aesthetic lifespan. Being penny wise here is pound foolish. Likewise, anything from old, faded store signage to self-adhesive price tags that haven’t been properly scraped off can detract from the overall experience. Yet another thing to keep in mind is that lighting brightness declines over time, making the sales floor look dingy and dirty, so budget for lighting upgrades accordingly. For nearly 70 years, Vulcan Industries has provided turnkey merchandising display solutions to diverse retailers and brand marketers, from design to delivery. They can even help you pinpoint ways to minimize wear and tear, repair, and maintenance requirements from the outset, thereby reducing cost. Taking into account store reconfiguration history, sales goals, seasonal merchandise, and even physical factors such as height, they can suggest stock point-of-purchase displays or custom-design a solution that best suits your retail scenario. For example, areas with oft-changing merchandise offerings may benefit from store fixtures with wheels, which allow you to relocate and update with ease. Similarly, modular fixtures offer the flexibility to add or subtract height from vertical retail displays, saving you from buying additional displays. Use POP displays that really pop. Creating the right POS displays for your company’s retail environment starts with asking the right questions. What are your specific marketing objectives? Who is your target customer? Who are you competing against? What retail context will it appear in? And, of course, how much can you spend? Vulcan Industries offers complete customizability and built-in flexibility, with merchandising displays designed with your current and future retail needs in mind. Thanks to years of manufacturing expertise and state-of-the-art machinery that can weld and laser-cut components quickly, Vulcan is able to save its clients time and money without compromising quality or durability. Value-engineered product redesigns and the option to manufacture overseas if lead time is sufficient are further ways that Vulcan can reduce the cost of custom store fixturing. Eco-friendly, intuitive, and easy to set up, Vulcan products will last for years, helping your business thrive in the long run. To begin creatively conceptualizing your retail display makeover, contact Vulcan Industries today. This entry was posted in Uncategorized by viadmin. Bookmark the permalink.